The Rotary Club of Placerville has a 75 year history of doing good in the world and doing good in Placerville. The linked article is a brief synopsis of the many projects taken on by our club. It is from a few years ago so does not include the beautiful metal sculptures along Highway 50, the refurbishment of the caboose at Spring St, or our fundraiser for the victims of the Camp Fire. Ever wonder who put in the "Welcome to Placerville" sign and flagpoles? How about all those oleander plants at the fairgrounds? How did Rotary Park come about? How about that basketball court at Benham Park? 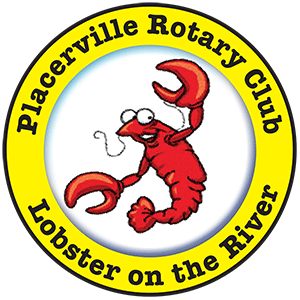 Follow the link to read about some of the great things the Rotary Club of Placerville has done in the past to make our community better. 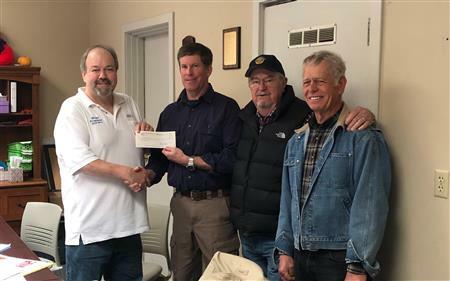 Placerville Rotary Club President Kurt Raffetto traveled to Chico on Thursday with Ron Thompson and Gordon Vicini to present a check to the Paradise Rotary Club for $100,000. Accepting the check on behalf of the Paradise Club was President Brian Gray. Over 90 percent of the Paradise Club members were directly impacted by the fire. The presentation was met with profuse thanks and applause. 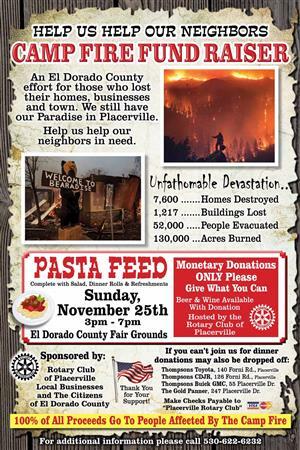 The check was a result of the Rotary Club Pasta Feed Fundraiser held on November 25th at the El Dorado County Fairgrounds. Placerville and El Dorado County citizens stepped up in a big way to help their neighbors to the north. Donations came in from as far away as Idaho and Arizona. Donations from the event totaled $91,000 with the Placerville Club making up the difference to reach $100,000. The Paradise Club will use 100 percent of the funds to benefit those impacted by the fires. While no specific plans are currently underway, the Placerville Rotary Club will keep in touch and find out how our generous communities’ dollars are spent. The Rotary Club of Placerville would like to again thank the generous contributors, volunteers, and corporate sponsors that made this fundraiser possible and such a tremendous success. For those still wishing to contribute, funds may be made out to The Rotary Club of Placerville and sent to PO Box 488, Placerville, CA 95667. The citizens of El Dorado County (and beyond) stepped up to our donation effort for the victims of the Camp Fire in Paradise and surrounding Butte County. Over $88,000 has been donated to the cause. We expect this to increase in the days ahead. The funds will be awarded to Rotary District 5160 and the Rotary Club of Paradise in the near future. Presentation dates are currently being coordinated. Donations are still coming in and we hope to have all collected by 6 December. Thank you so much to Gordon Vicini and crew for the wonderful food. The farms and ranches of the Apple Hill Growers for the delicious desserts and wineries of the El Dorado Winery Association for the adult beverages. Barsotti Family Juice Company took care of the crowd with non-alcoholic juices and some great hard cider. Thanks, too, to Red Hawk casino for the water for our crowd of nearly 1,500 people. If you couldn't attend but still want to contribute, you may mail a check to The Rotary Club of Placerville, PO Box 488, Placerville, CA. 95667. Thank you! Thank you to all for making our Lobster on the River event a great success. It was great seeing Hangtown Little League families, fellow Rotarians, and the community at large supporting our effort to put in a batting cage at Rotary Park. We netted over $9,000 for the project and are well on our way to getting the batting cage installed. The Placerville Community has lost an icon. Joe Stancil passed away recently but left a legacy of making the community a better place.